Their twist on a classic. 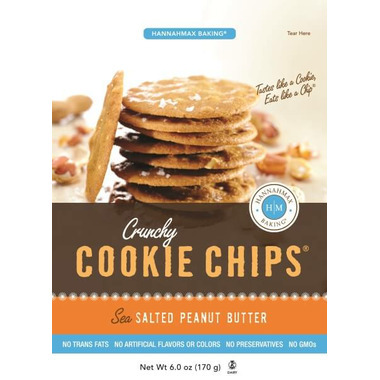 They start with deliciously simple cookie dough and fold in creamy peanut butter, roasted peanuts and a sprinkle of pure Mediterranean Sea Salt. It’s like falling in love with peanut butter cookies for the first time! Ingredients: Unbleached enriched wheat flour (niacin, reduced iron, thiamin mononitrate, riboflavin, folic acid), brown cane sugar, unsalted butter, cane sugar, peanuts, cage free eggs, natural peanut butter (peanuts, salt), sea salt, vanilla extract, and baking soda. Contains: Peanuts, wheat, milk and eggs. Manufactured in a facility that processes other products that contain soy and tree nuts. Tasty cookies with a satisfying crunch. It's hard to only eat a few- they're small and light, so it's easy to keep going back to the bag.